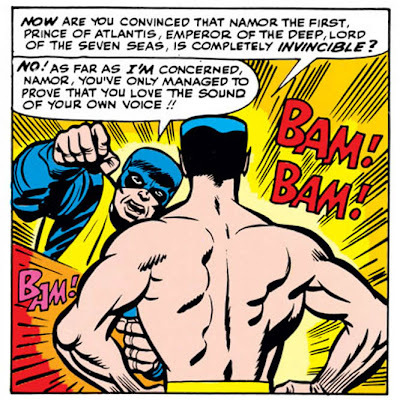 Just a couple of months ago, the Sub-Mariner fought the Avengers, before returning to menace the Fantastic Four once again. And now, he (temporarily) teams up with the Brotherhood of Evil Mutants to face off against the X-Men. 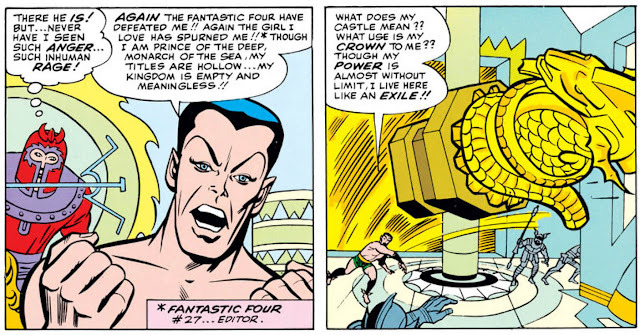 As Stan has already done with the Hulk, so too might he be intentionally keeping Subby in the reader's sights, certain that the time will come when he can spin the multifaceted character off into his own feature. It won't happen as soon as it will for the Hulk - another year and a half, as opposed to just a couple of months till the Hulk's new strip - but you can tell Stan is already planting the seeds...! Dude's got some major anger management issues. On a similar note, Stan's not letting the readership forget about Magneto, as this is the fourth issue - out of a mere six - to feature the Master of Magnetism. And it's the third issue in a row to feature the Evil Bro's! Readers could be forgiven for wondering if Stan & Jack had fallen into a creative rut on this new title already, but that's not the case; rather, they've realized that Magneto and the Evil Mutants make for some fantastic foils against Professor X and his X-Men - and that with a truly rich cast of villains like this, it's worth spending some time on exploring who they are. Tie your shoelaces and you might detonate the car! That said, this issue featuring the Brotherhood of Evil Mutants came out the same week as The Avengers #6, in which that team fought the Masters of Evil. Sense a theme? In the comments to that post, we talked about the preponderance of bad guys who freely refer to themselves in such a fashion, and why that might be. (As Barry put it, "Does anyone ever call themselves evil? These guys have very low self-esteem.") 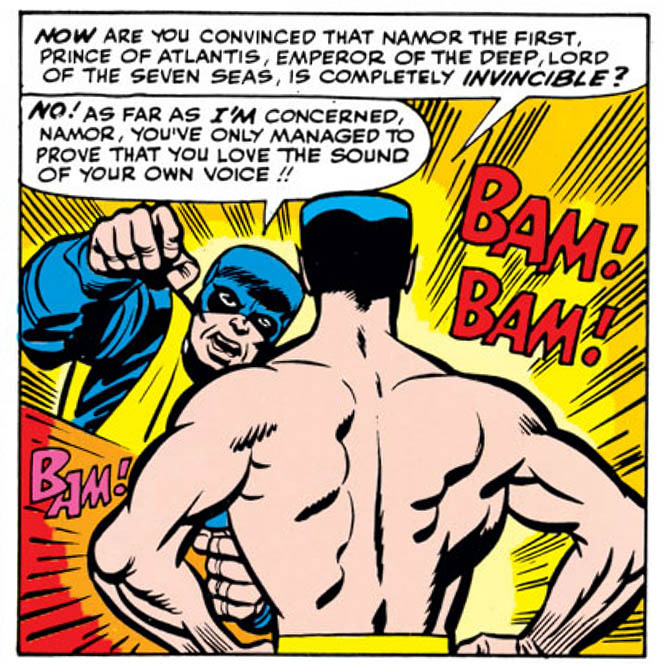 In the ensuing discussion, we agreed that it's simply part of the shorthand of the time, where Stan used names and descriptions that told you all you needed to know about a character or a group in as few words as possible. Yes, it came at the cost of subtlety, but when applied across the breadth of an entire issue, it contributed to an economy of storytelling. Compare this to the common complaint with many comics today, where the storytelling may be realistically subtle, yet distressingly takes six whole issues to tell a single story. A year later, you've not read twelve distinct stories - you've read TWO! Is there a "sweet spot" to be had, a compromise that could combine the narrative density of years past with the subtle storytelling skills of today? I believe there can be, yes - but to my continued frustration, it seems few modern creators are interested in exploring that. And it seemed like they were getting on so well...! To have some fun with nitpicking, there are definitely some developments in this issue that are laughable or otherwise just bizarre. Along with the "Evil" naming conventions already described, the cover shows Magneto attacking with our heroes with a magnet. And not just any magnet, but a ridiculously unsubtle horseshoe magnet. 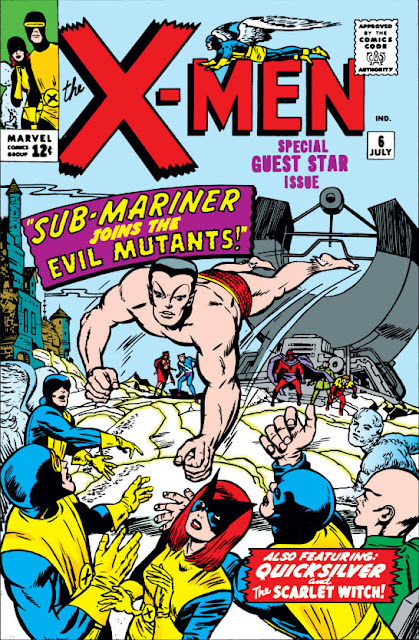 And early on, in his bid to track down the Sub-Mariner, Magneto settles himself into his throne and relaxes his mind, sending out his astral self to search the seven seas. Wait a minute, what? Magneto can astral project? How?! Professor X: Sure, that makes sense. And Doctor Strange: Of course! That entirely fits his mystical makeup. But what on earth does astral projection have to do with magnets?! I suspect this is something that later writers probably went back and explained, but right here, out of the blue, it seems like a case of Stan's occasional sloppiness in granting characters brand-new powers just because it makes the plot easier, like the Human Torch's trick of creating living, thinking duplicates which can operate with complete independence, or the Sub-Mariner's quickly-forgotten ability to mimic the abilities of the creatures of the sea. Fortunately, this isn't an error in judgment that Stan falls prey to very often - perhaps with an instinctive understanding that operating within the limits allows for far more drama than operating without - but that does make it all the more noticeable on the few occasions when he falters.